A major Middlesbrough logistics company has signed a pledge to support ex-members of the armed forces to find work in their sector. 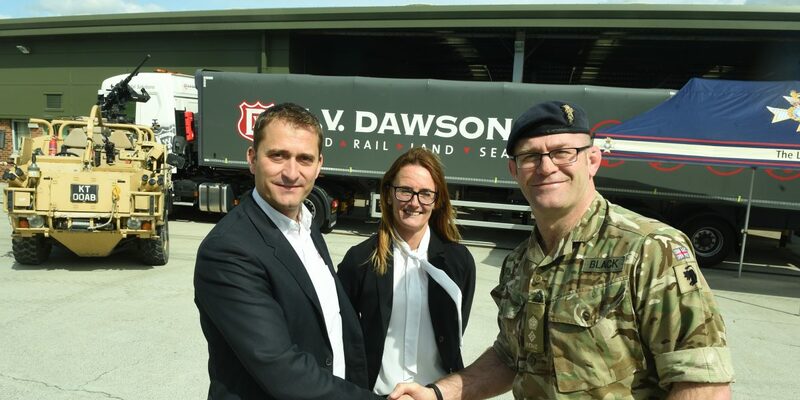 AV Dawson, which employs 240 people in Tees Valley has signed an Armed Forces Bronze Covenant to ensure there is complete fairness and respect in the communities where the personnel live, as well as local job opportunities. It has also pledged to encourage more logistics businesses to see the potential of former military personnel with their in-depth practical training. The support comes in various forms including working with the Career Transition Partnership in order to establish tailored employment pathways for service leavers. AV Dawson also supports the employment of service spouses and partners and grants leave for service spouses and partners before, during and after partner’s deployment. Gary Dawson, Managing Director AV Dawson said: “We have armed forces veterans employed in most areas of our business. The skills they build up during their service are invaluable and easily transitioned into businesses like ours. We wanted a way to show our on-going commitment to our service veterans and the Armed Forces Covenant was the natural next step. The company is a member of North East England Chamber of Commerce which has also signed an Armed Forces Covenant. In addition to identifying job opportunities the business will also support employees who choose to be members of the Reserve Forces. accommodating their training and deployment where possible. As a former member of the armed forces I understand fully the tremendous skills these people have to bring to companies. They are among the most disciplined and determined employees I have ever had the pleasure to work with. AV Dawson signing this covenant will be a huge benefit to ex-service personnel and the business itself. I wholeheartedly encourage other logistics businesses to follow their inspirational lead.